This week I am going to post images with the subject of “happy people.” I made all the photos while at the Martinsville Speedway race weekend a couple of weeks ago. For each, I’ll write a few words…beginning with the photo you see here. First, however, some background. It’s been my habit since 2002 to go over to the speedway, which is a short two miles from our home, usually on Friday of race week, and then on Saturday for the Craftsman Series truck race or Sunday for the Sprint Cup Series race…or both…depending on my motivation. My routine on going Friday was always to first, buy a new NASCAR driver’s hat, and maybe a shirt or other clothing item to dazzle others during the following year. I also developed the habit on Friday of always eating two famous Martinsville Speedway, Jesse Jones brand hotdogs…all the way…with chili, cold slaw, mustard and relish. Plus a cold Dr. Pepper. Health-wise, Jesse Jones hotdogs are not that bad…compared to what you ask. No matter…I love them, as do millions of others down south. Things did not seem right if I failed to follow this Friday routine. This year, it rained hard all day Friday so I decided not to go over to the track…for obvious reasons. Plus, I did not have tickets for either race, and felt sort of bad about that. On Saturday, the sun came out and I decided race tickets or not, I must go to the track to buy a new hat, and to eat those wonderful hotdogs. I also took my camera along, as I always do, to record what I saw, and to convey what I experienced. While there, listening to the roaring car engines inside the track during a practice session, I regretted not having tickets for the main race on Sunday…but told myself I would erase that regret by going to the races next Spring. 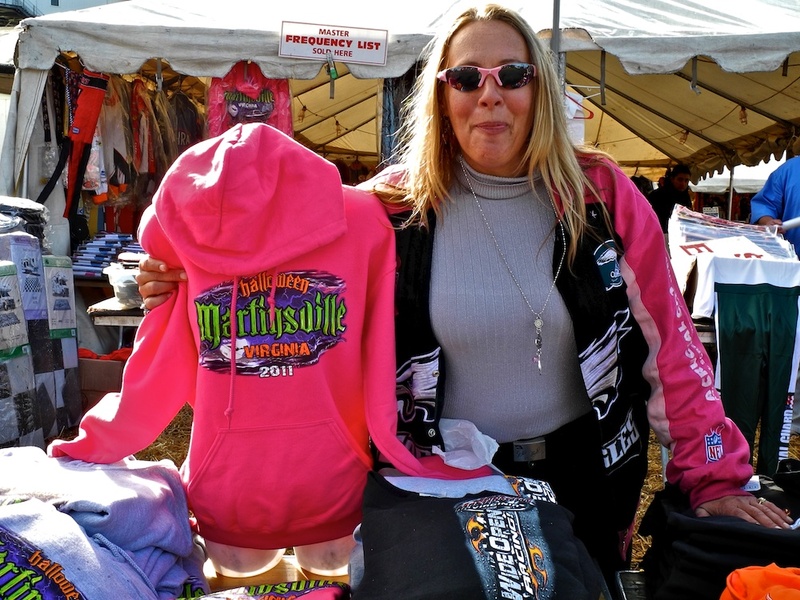 While I was wandering around looking at all the fun and excitement on Saturday, I stopped to look at some sweatshirts for sale, and this nice lady asked if I would like her to pose next to one of the most popular items she was selling. I said, “Sure would!” People are so nice at a NASCAR event…except for some of the drivers…but that’s another story. Look for more happy people photos later this week!